Late afternoon. Columbus Park. Children dash madly around the playground, laughing and screaming in delight. Two elderly men play Chinese checkers, eyes never straying from the game. Behind them, sitting in a loose circle, musicians play a mid-tempo melody on string instruments, their music competing with the din of the park. In the central square, tourists mill about, snapping photos and warily eyeing the pigeons, who strut through the crowd like they own the place. And they do, don't they? New York City pigeons have it made. You can catch this scene in Columbus Park on almost any sunny day. It is a fantastic place to people-watch or to simply rest your aching feet (if you can find a seat). But it wasn't always so. 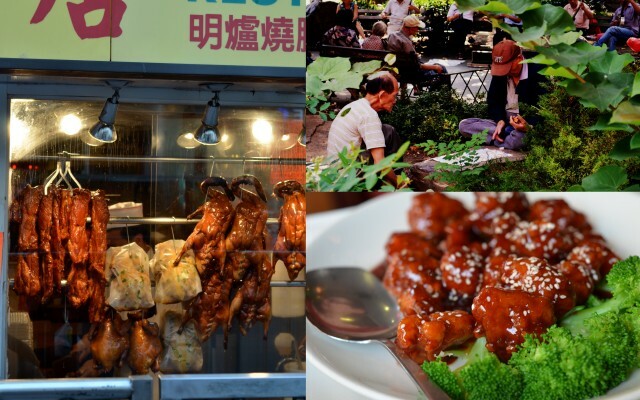 The area that now houses Columbus Park and Manhattan's Chinatown has undergone several extreme makeovers over the past two centuries, from swampland to slum to a lively neighborhood that is now home to some of the best Chinese food in New York. 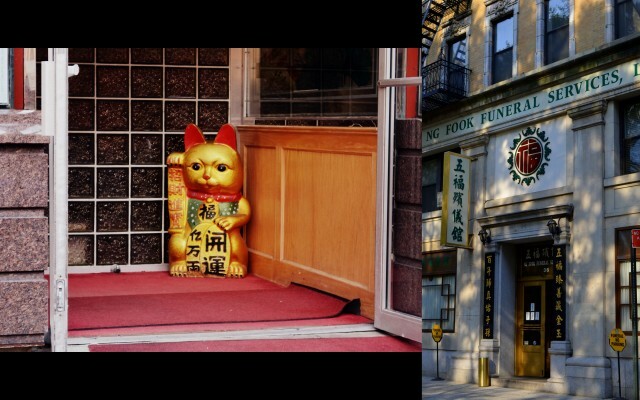 Old Shanghai Deluxe's "little" kitty, and a funeral parlor across from Columbus Park. Life and death live in close quarters in this city. While there are countless Chinatown restaurant reviews online - and I would recommend doing your homework before you set out - there is something exciting in choosing your next meal by chance. My friend, K., and I went on just such an exploratory mission on a recent walk through the neighborhood, and we stumbled upon the Old Shanghai Deluxe. K. and I were both pleased with the Sesame Chicken ($11.95), Pan Fried Noodles with Pork ($7.95), and Vegetable Dumplings ($4.50) - we enjoyed the tenderness of the pork and chicken, the dishes were not too salty, and the noodles were especially good. This is not the best Chinese food you can find in the city, and I will be sure to do my homework the next time I venture out for a meal in Chinatown, but if you embark on a lunch adventure and find yourself in Old Shanghai Restaurant, you'll walk away satisfied enough. I love Columbus Park where Chinese gamblers and musicians thrive while multi-generation families enjoy themselves. Old Shanghai Restaurant is pretty good. Next time try Joe's Shanghai, really special (no credit cards) and Chinatown Ice Cream Factory for dessert. You paint such a poetic picture of this area, makes me want to go down there. It's been a long time since I simply enjoyed Chinatown, instead of just dashing through. Congrats on taking the bar, what an immense accomplishment! Thank you for the kind words, Ralph! I thought of you when I strolled around the area, knowing how much you enjoy exploring the city, and I've made a note of your recommendations for the next trip down there. Thanks, Louisa! It's nice to be able to enjoy the little things in life again now that I have time!